Grammar Nazis aren’t proof-readers. Nitpickers aren’t proof-readers. Super-critical people who pick over the bones of your work and then post in the comments about how bad your proofing skills are, aren’t proof-readers. It does require some skill, but the other quality which a lot of people who do amateur proofing don’t realize that they need is a little humility. Why? Because even the best proof-reader is likely to make mistakes at some point. You train to eradicate blind-spots as much as you can; you research and discover tools that help you to better perform your job, but you are still going to make errors. Professional doesn’t mean flawless or foolproof. I’ve read great articles and still tripped over grammar errors or typos that you, for a second, get very indignant about, but then try and consider this – how many times have you pointed out someone’s error and made a mistake while typing out the correction? 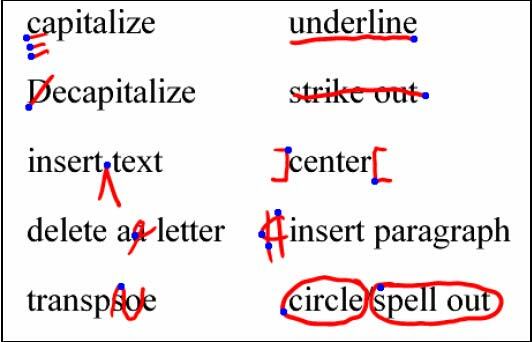 A dropped out word doesn’t flag up on the screen; neither does a correctly spelled word in the wrong place – well, this can be adjusted for in your spelling correction software, but don’t dream that it’s going to be a hundred percent fool-proof. So what is the best thing for a proof-reader to do? Get a second set of eyes laid on your work. It in no way lessens your professionalism, and in fact it is the mark of a professional that you can set ego aside and put the importance of the work first. When I trained as a journalist one of the things I had to get used to was getting my work bounced back to me several times to make edits, and when I finally got it pushed through the process I was confident that it did what it needed to do, and that it was a good piece. So once you get over the roadblocks that you as a proof-reader may have put in the road, what are the other things you can expect to encounter? When it comes to proofing other people’s work, I have bumped up against one thing more than any other – people take the suggestions that you make to them about their work very personally. I have read some pieces that had tense issues, spelling issues, grammar issues, and problems with shifting for first to third person and back again, and by cleaning up these things the work would have majorly benefited. There is the perception that proofing is easy, and anyone can do it. To a degree this is true, but you want someone that is detail-oriented, and if you have someone that is an experienced proof-reader, their choices are likely to be a little better informed than someone sitting down to do it for the first time. Conversely, when you give someone the breakdown of what needs to be done to correct their work, they will often turn around and tell you that it is too hard, it is inessential and isn’t really going to affect the reading pleasure of the audience; and then the writer will tell you they intended it to read that way. What? Nonsensically? What is the intent of someone sitting down to proof-read your work? Well, if they are a professional it is generally to help you improve it. Editing obviously comes before, or should, but there is sometimes a collapsing of the roles into one another. Proofing is more about looking at the structural architecture of a piece; editing hits more at the meat of the piece and its intent and what it is communicating, though the how does play a part of this. This idea that you shouldn’t offend anyone is kind of where a lot of the inability to take even constructive criticism comes from, but in a professional environment it just isn’t useful. If ego gets in the way of turning out a good product then ego is a problem. If you have mechanics in a shop and a chief mechanic that runs them, quality checks their work, and then can’t tell them for fear of offending them, then that is an issue … people are going to leave with cars that might break down or be dangerous. No one is going to die from faulty copy (we won’t get into a Brazil scenario here), but you could end up making inaccurate or libelous statements; and you might lose future customers because of your badly constructed writing. So, it is important, and it means you are going to have to set aside your pride and at least be able to listen to what is being said. I am a British writer working with American English, and I am responsible for proofing a lot of my own work, and I sometimes have to think about grammar, idioms, spelling, and all the pitfalls of the continental drift that has occurred with the language. I do pretty well, but sometimes I have to ask. I have a degree in English; I trained as a journalist; I have been writing and involved in publishing for years, but the one thing I know that makes me a better writer, and a better proof-reader, it knowing that I always have more to learn. If you find any errors in the above text feel free to tell me, but as you do that, take a second and look at your motivation – are you doing it to to point out how wrong I am as a proof-reader, or are you doing it to help?